Now we can say it: The topic of Industry 4.0 is really established at a global level, under different names and shapes. In Germany it is known as "Industrie 4.0", in China as "Made in China 2025", and as "Industrial Internet Consortium" in the U.S.. But who is really benefiting from this industrial revolution? And to what extent we could see a change in the way of carrying out manufacturing processes? 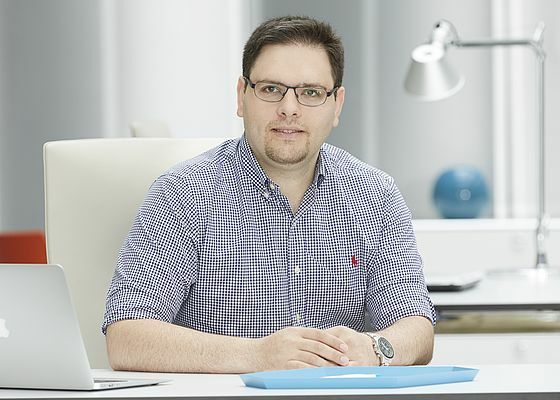 ‘’At least in plant engineering, I am not sure if we can call it a change.’’ commented Dr. Pouria Bigvand, Director Product Management at Aucotec. More and more companies are moving towards digitalization, but not as many as expected. It’s not a matter of being blind in front of all the great opportunities that digitalization and networked production processes offer, but companies still need a guidance and detailed clarifications about how they can safely move to Industry 4.0 without unexpected consequences for engineering. One of the most controversial topics, for example, is that the Internet of Things (IoT) caused a change in roles for plant designers and operators, and in the future we will have autonomous, learning devices and components that put into question the collaboration between men and machines. The consequence is that developers are more and more responsible of managing tasks which in the past were an exclusive responsibility of plant operators. Plant operators and developers are therefore facing various complicated challenges, and for this reason they need self-sufficient systems that can respond flexibly to new unexpected situations and can communicate independently. ‘’There are many specific topics such as communication protocols and content of these protocols or semantics of data exchange etc. 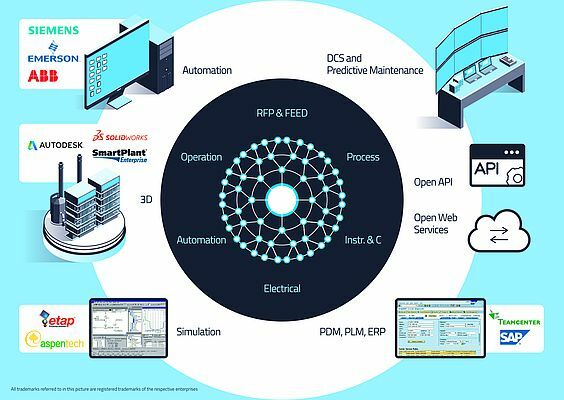 which have been discussed by operators and IT experts, nonetheless, the bottom line is to find a common ground and abstraction level for effective communication between various parts of a plant in their different phases of their lifecycle.’’ said Dr. Bigvand. A uniform and solid platform is therefore key to effectively help engineers and operators achieve the new targets established by the market, such as maximization of production, faster time to market in engineering. ‘’In this scenario, isolated digitalization of silos is an easier start to a faster dead end.’’ commented Dr. Bigvand. Which kind of engineering platform? What this platform must ensure is the implementation of a series of mechanisms which guarantee that the production station operates safely and reliably, but this must be done without adding excessive regulation. 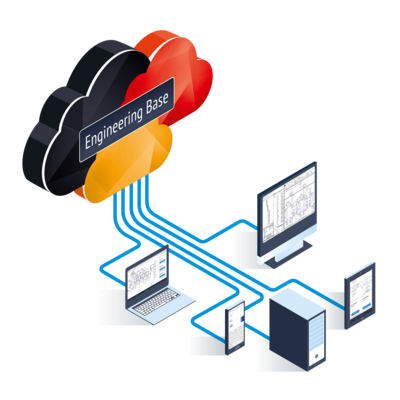 To meet this need, Aucotec engineered the Engineering Base (EB) platform, a database-driven, function-oriented and multidisciplinary systems that was firstly conceived 15 years ago. The platform is in use in various industries and links design processes in the wire harness design of mass-produced vehicles as well as in the construction of satellites, special-purpose machines, power grids or chemical and other large-scale plants. ‘’EB was genuinely designed to serve as an engineering platform which is fully object-oriented, and it is discipline, language, location and OS (operating system) independent. EB that does not request additional synchronizers or fundaments to provide a common ground for all design disciplines, operations and maintenance engineers in a sole database and versatile data model.’’ explained Pouria Bigvand. Predictive maintenance is getting a central role for the right implementation of the principles of IoT and it must ensure a high level of reliability and accuracy. ‘’The more intelligence is added to individual modules and communication possibilities are provided, the more reliable gets the prediction.’’ said Dr. Bigvand. The advantage is also that predictive methods appear much cheaper in planning and execution compared to preventive methods. ‘’I can imagine that, if the full capacity of IoT is employed, predictive maintenance can significantly minimize plants downtime and allow annual regular preventive maintenance.’’ added Pouria Bigvand. Standardization would be an effective way to boost IoT in companies and processes, reducing the complexity of mappings for data communication, but most of the time it isn’t the easiest way. ‘’Standardization requires all-sided commitments of conformity and this means long and expensive discussions.’’ Explained Dr. Bigvand. If we want to be pragmatic and act fast, a flexible but powerful platform and a versatile expandable data model – in a much larger way than standardization would make it possible – seems to be a consistent solution. ‘’Our EB provided so far unique opportunities to design and maintenance engineers to realize complete engineering of production plants in a single database and data model.’’ commented Dr. Bigvand. The next step would be the incorporation in the EB platform of smart algorithms for comprehensive evaluation of the plant data model to open new horizons in the area of HAZOP, HAZID and automatic cause & effect logics.